Perfect for the home office or small business, Dauntless provides excellent one-hour UL rated fire protection and UL-RSC rated theft protection. These safes feature high quality dial combination locks (digital combination locks optional) with an internal relocking device. 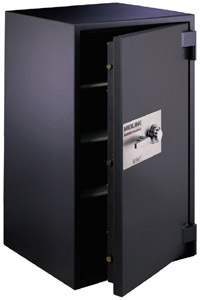 Dauntless safes address every aspect of protection at a value added price. These key features increase confidence that your valuables will be protected. Features UL Listed relocking device for extra security Drill resistant steel hardplate protects the combination lock Vertical and horizontal bolts resist prying Bolt-O-Matic door guard automatically extends the 1" bolts when the door is closed UL Rated Group II combination lock is standard with over 1,000,000 combinations Optional Sargent & Greenleaf electronic lock automatically locks safe when door is closed Adjustable ball bearing hinges for smooth operation Available in graphite or taupe. Seven different sizes with inner capacity ranging from 1.4 to 18 cubic feet. To view spec sheet in PDF format CLICK HERE. (5 MB).